Yesterday's action was marked by fear as evidenced by the 20% spike in the VIX. This morning the SPY is gapping up 1.5%. 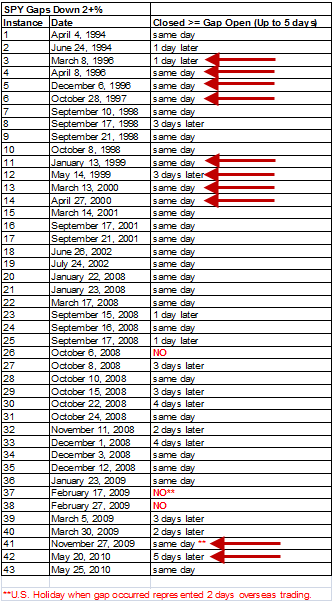 Here's a quick look at other instances where extreme fear turned to extreme euphoria while the NYSE was closed. In last night's letter I reviewed a large number of studies that suggested a bounce is likely to ensue in the next few days. Below is one example. It can be difficult to know whether a very strong reaction is an overreaction. It can sometimes help to compare it to similar moves in the past. The table below is one I last showed in the 2/2/2009 blog. 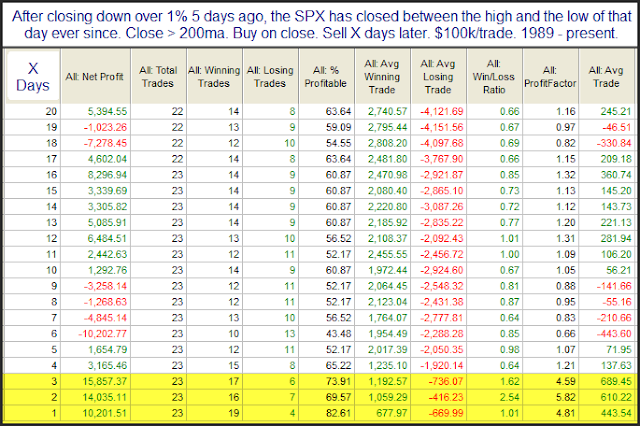 It looks at all the times the SPY gapped down at least 2% to start the day. 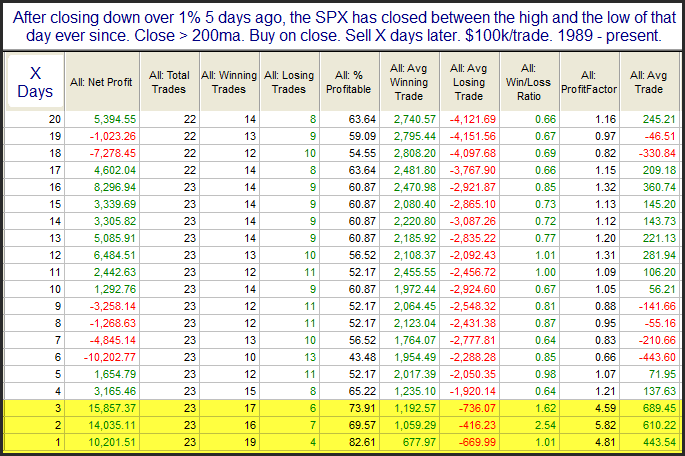 The column on the right shows how long it took for SPY to close above its gap down open (up to a week). Today I’ve also added some red arrows. These mark the other times the gap down occurred following a close above the 200ma. As you'll note, a 2% gap in an uptrend is quite unusual. And of course much more information can be found in the "Quantifiable Edges Guide to Fed Days" ebook and book. About three years ago I did a post on triangle formations. 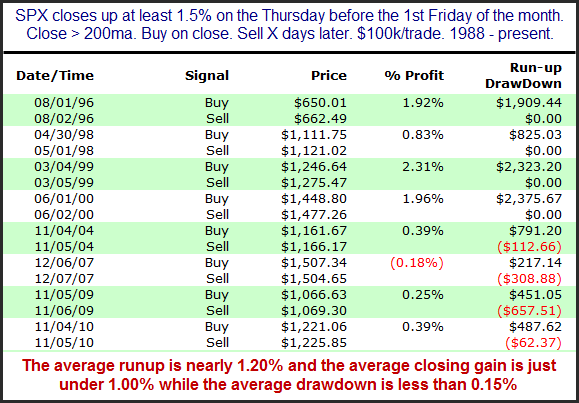 I looked at success rates and profit potential of playing breakout of them. You may view those previous findings here. Last night in the subscriber letter I took a new look at these formations and what a break (like we saw yesterday) might mean. 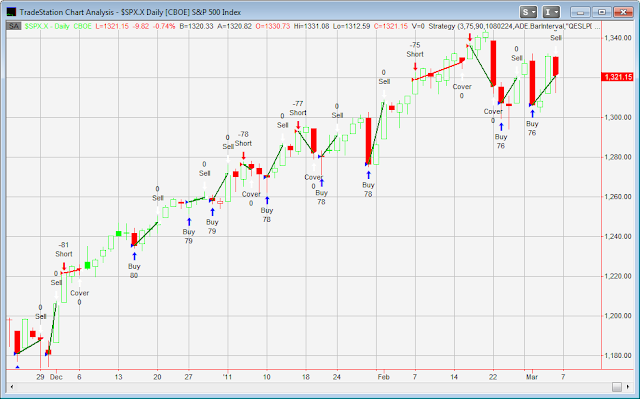 For coding purposes I simply defined a triangle as a pattern where the most recent swing high was lower than the previous swing high, and the most recent swing low was higher than the previous swing low, and the market was currently between those two points. This admittedly isn't the most sophisticated description, and some market technicians might suggest additional nuances should be included. Still, it seemed to be enough to identify the basic pattern of a tightening range. 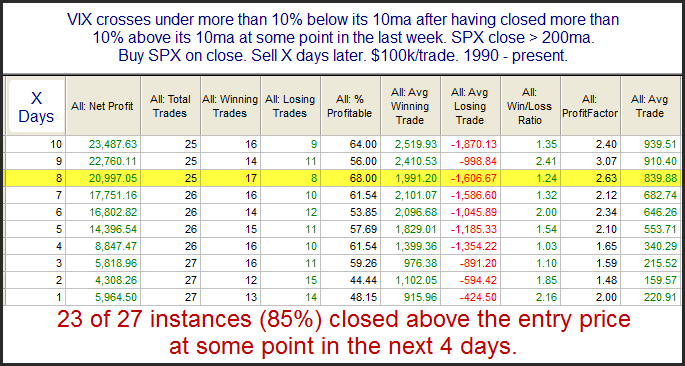 I set the entry parameter to be a break above the most recent swing high or below the most recent swing low. Here it could certainly be argued that a trend line break might be more effective. I personally don't believe it would make a whole lot of difference. Once entered the strategy was designed to exit when price either reached its target or its stop area. To calculate the target price I simply took the height of the triangle and extended that past the entry point. The stop was set at the opposing swing high or swing low that would have triggered an entry in the opposite direction had the triangle broken the other way. No trailing stops or other trade management techniques were incorporated. Results in general were much like those results I discussed 3 years ago. I did break it down a number of different ways, though. 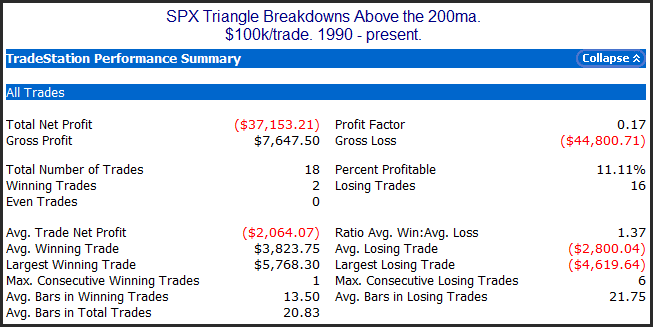 One interesting set of results came from looking at triangle breakdowns in the SPX when it was in a long-term uptrend. Those results can be seen below. Entries and exits are as I described above. 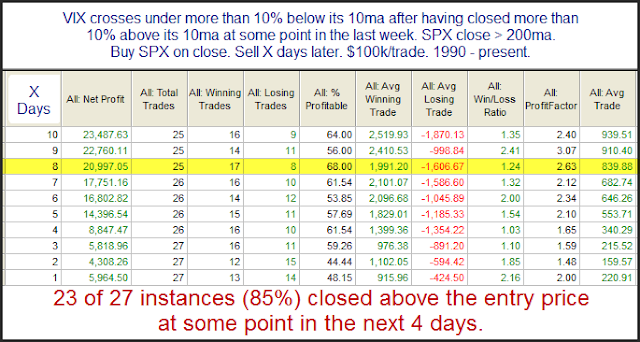 So in this case the results show the performance of shorting a breakdown. As you can see there has been an strong tendency for this trade to reverse back up and be stopped out before reaching its downside target. More information on triangles can be found in last night’s letter. Subscribers are also being provided with the code so that they may explore triangle formations more on their own. If you’d like to read Thursday’s letter just click here to register for a free trial. With only 3 instances I wouldn't get too worked up. I did find results interesting eough to share, though. A few months ago I shared my POMO Stimulus Indicator. The POMO Stimulus Indicator simply measures the total volume that the Fed either pumps into or withdraws from the system through POMO activity over a running 20-day period. Indicator data is taken directly from the Fed’s POMO database. "Par accepted" is the measurement used. In the November 30th blog I showed a long-term chart with the indicator applied. At the time the indicator was readying to make new all-time highs. Below is an updated chart in which I have zoomed in just to examine the last year and a half. As you can see, POMO Stimulus levels have remained above the 2009 highs ever since moving above them in November. The indicator posted its highest reading in early February, and while the amount pumped this past 20 days is down from its peak, it is still over 35% higher than the 2009 highs. It has now remained somewhere between 30% and 50% above those 2009 highs for an extended period of time. "Don't fight the Fed" is an old market adage. The market has been responding very well to the massive amounts of stimulus the Fed has been pumping into the monetary system. QE2 is supposed to last until around June. 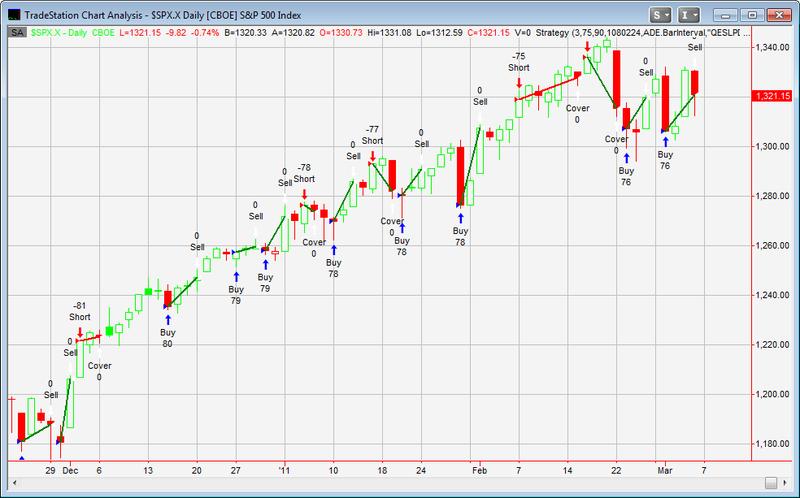 Traders would be well advised to keep track of POMO stimulus levels over the next several months and beyond. I believe there is ample evidence suggesting such activity is capable of providing a strong wind to the back (or the face) of the market. I personally update this chart on a weekly basis and post it in my subscriber letter. If you're interested in seeing the upcoming schedule for POMO activity, you can find that on the Fed’s website. It's worth noting that the current schedule calls for POMO buying every day from now through March 9th, and the schedule is set to be updated on March 10th for the following month. In other words, no slowdown yet.